Significant find. Rare card. Superior eye appeal. Sports card collecting has seen its share of these proclamations made, past and present, and at a rate that would jade the most grizzled of hobby veterans. “These claims are routinely overused,” said Rick Snyder, owner of MINT State, a PSA Authorized Dealer specializing in rare, high-grade sports cards, based in Myrtle Beach, South Carolina. “It seems like a matter of recourse for all dealers who specialize in valuable collectibles.” At a time when significant finds of rare cards with superior eye appeal are feared to be a phenomenon of days long gone, MINT State is privileged to present what is quite possibly the single greatest sports card discovery of all-time, The Lucky 7 Find. The T206 White Border set, affectionately known as “The Monster,” is not only the premier set of the tobacco-card era, it is indisputably the most collected and valuable baseball card set ever issued. Perhaps best known for its inclusion of the “Holy Grail” of sports card collecting, the iconic Honus Wagner, the T206 set contains 524 different cards with sixteen tobacco brand advertisement backs. The rarest ad back – and by a considerable margin – is the “Ty Cobb” reverse design which proclaims Cobb to be the “King of the Smoking Tobacco World.” Found only on the reverse of the Ty Cobb red background portrait, one of four Cobb cards in the T206 set, the “Ty Cobb” back is by far the rarest of the 16 tobacco brand backs with approximately 15 known examples as of February, 2016. 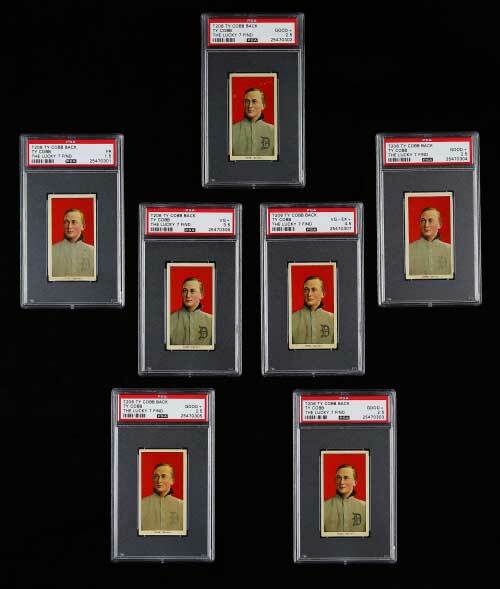 Considered one of the great prizes among collectors, the T206 Ty Cobb with “Ty Cobb Tobacco” back is not only much scarcer than the Wagner, its unique nature makes the case it should have never been classified as a T206 many years ago by Jefferson Burdick, the pioneering author of The American Card Catalog. Until today, the highest grade ever assigned by PSA to any example of the Ty Cobb with Ty Cobb back is VG 3. “The Lucky 7 Find is about to change the entire landscape of this incredibly rare and valuable card,” reported Snyder. “The cards were found in a torn paper bag that was on the floor, and the bag was old and in bad shape like it had been there for a while. At first, we thought the bag was trash and was initially overlooked as such. After looking around at other things found in his old house, we were drawn back to that paper bag. The bag was picked up, opened, and then we realized there were post cards and other different types of cards inside. At the bottom of the bag, face down, were the seven Cobb cards. The PSA assigned grades include: FR 1.5 (1 card), Good+ 2.5 (4 cards), VG+ 3.5 (1 card), and VG-EX+ 4.5 (1 card). 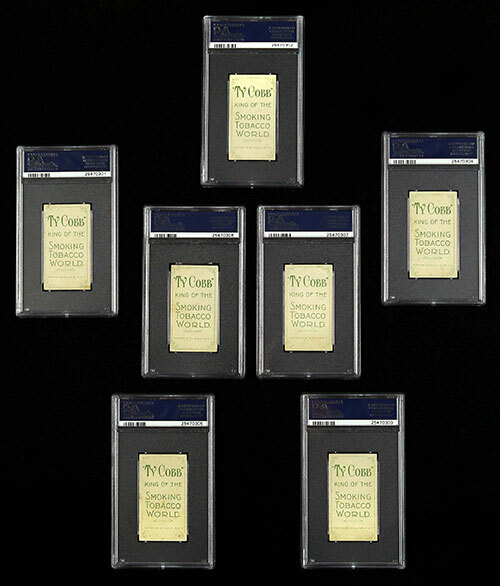 The PSA 3.5 and 4.5 represent the two highest graded examples of the rare and valuable T206 Ty Cobb with Ty Cobb back. Click here to read Joe Orlando’s article on the PSA website about The Lucky 7 Find.